I really like this, I would like your permission to use it as a title screen in my video, I will list your name in the credits. 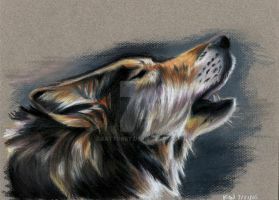 A wolf is my most favorite animal of all times. I like it so much ! This is really great! I love the moon in this shot. OMG this drawing is AWESOME! Generaly,I don't like the wolves...I'm not a little girl but i don't know...they look so bad and ready to eat all what they see,but in this photo,i don't know ,they look so brave without arms,they have'nt home simply stay and watch how moon comes on the sky.And,in this photo,yeah,i like them.So,if you can to convice a girl that hates wolves to like them a bit,you are awesome,like your arts!Wonderful! WOW is nice, is very impresionant. Love the moon in the background. I love the looming moon . . .